Visakhapatnam (nicknamed Vizag) is the largest city, both in terms of area and population in the Indian state of Andhra Pradesh. It is located on the coast of Bay of Bengal in the north eastern region of the state. It is the administrative headquarters of Visakhapatnam district and also the Financial Capital of Andhra Pradesh. Visakhapatnam has been selected as one of the hundred Indian cities to be developed as a smart city under PM Narendra Modi's flagship Smart Cities Mission. Visakhapatnam was ranked as the fifth cleanest city in India according to the government's Swachhta Sarvekshan rankings. As of 2011, the population of the city was recorded as 2,035,922, making it the 14th largest city in the country. The Visakhapatnam Metropolitan Region is the 9th most populous in India with a population of 5,340,000. Visakhapatnam's economy ranks as the eighth-largest among Indian cities, with a GDP of $48 Billion (USD). Visakhapatnam is the principal commercial hub of the state, and contributes to its economy in many sectors such as heavy industries, tourism, industrial minerals, fishing, and information technology. Visakhapatnam Port is the fifth busiest port in India in terms of cargo handled. Visakhapatnam is home to the oldest shipyard and the only natural harbour on the east coast of India. Visakhapatnam's history stretches back to the 6th century BCE. Historically, it was considered part of the Kalinga ancient region, and later ruled by the Vengi kingdom, the Pallava and Eastern Ganga dynasties. Archaeological records suggest that the present city was built around the 11th and 12th centuries CE with control over the city fluctuating between the Chola Dynasty and the Gajapati Kingdom until its conquest by the Vijayanagara Empire in the 15th century. Conquered by the Mughals in the 16th century, European powers eventually set up trading interests in the city, and by the end of the 18th century it had come under French rule. Control passed to the British in 1804 and it remained under British colonial rule until India's independence in 1947. After independence, Visakhapatnam developed into one of the country's chief ports and became the headquarters of the Eastern Naval Command of the Indian Navy. The city is nestled between the Eastern Ghats mountain range and the Bay of Bengal, and is often known as The Jewel of the East Coast, The City of Destiny and the Goa of the East Coast. Visakhapatnam's beaches (such as Ramakrishna Mission Beach and Rushikonda), parks (such as Kailasagiri and VUDA Park), museums (such as the Kursura Submarine Museum and Visakha Museum), and proximity to areas of natural beauty (such as the Kambalakonda Wildlife Sanctuary, Araku Valley, and Borra Caves) have helped the city become a significant tourist destination. Visakhapatnam is one of the main tourism destinations in the state of Andhra Pradesh. The city is famous for beaches, caves and the Eastern Ghats as well as wildlife sanctuaries. The landmarks of the city include Dolphin's Nose, Lighthouse, Kailasagiri, Beach Road, VUDA Park, Visakha Museum and Matsyadarsini (an aquarium). INS Kursura Submarine Museum is the only of its kind in India. Indira Gandhi Zoological Park in the city has variety of wildlife species. Erra Matti Dibbalu (Red sand dunes) are situated between Visakhapatnam and Bheemunipatnam are one of the geo-heritage sites in the country. This tourist spot is now protected and preserved as a heritage site. Dr Ramanaidu Film Studio in 33 acres space off the Visakha-Bhimili beach road is one of the film shootings destination. Telugu Heritage museum on atop Kailasagiri amid picturesque surroundings is developed by World Telugu Federation and Visakhapatnam Urban Development Authority, Vuda City Central Park. Adding one more feather to its cap visakhapatnam has got india's tallest musical fountain opened in the central park. Oscillating vertically at 360 degrees, the fountain dances to the tune of digital music in different colors. Beaches along the coastline of the Bay of Bengal are Ramakrishna Mission Beach, Rushikonda Beach and Mangamaripeta Beach. 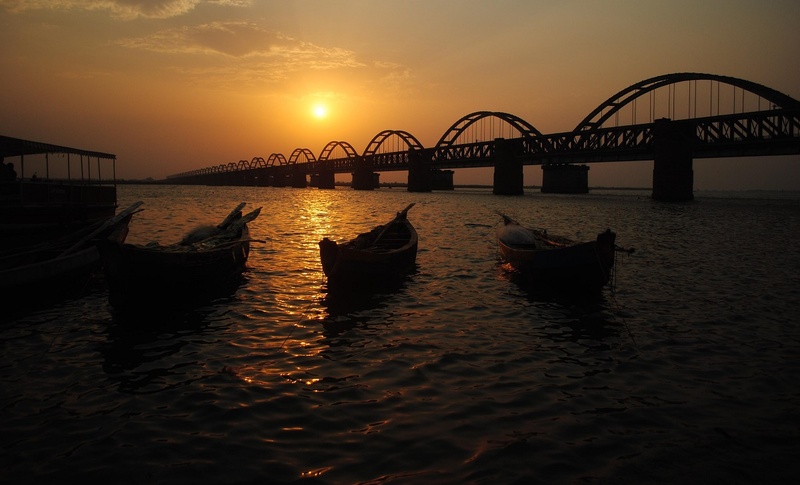 Others include Yarada, Bheemili, Lawson's Bay, Tenneti, Sagar Nagar and Gangavaram beaches. Araku Valley, 112 km (70 mi) from Visakhapatnam is a hill station at an elevation of over 1,000 metres (3,300 ft). Borra Caves are caves discovered by British geologist William King in 1807. Tyda (an Eco tourism project), Kambalakonda Wildlife Sanctuary under Andhra Pradesh Forest Department are wildlife conservation sites near the city. Kondakarla Ava, a natural lake and bird sanctuary, is 50 km south of Visakhapatanam.